The politics of anti-politics is a great American comedy. Contempt for Washington has become one of the primary qualifications for elevation to Washington. Those who despise government are desperate to join it; those who despise politics are politicians. And those who cherish government and cherish politics are ominously instructed by their consultants to be silent. Inside the system they pretend that they are outside the system, and denounce the institutions as if they are not talking about themselves. Even the president poses as a marginal man, which of course has the effect of marginalizing him. Obama is reaping the harvest of his superiority to the sordidness of power: the revival of the American right in 2009-2010 was owed in part to his squandering of his early strength upon a prissy dream of bipartisanship, or post-partisanship-not of compromise, which has a place in a universe of conflict, but of a utopian sort of consensus in which “faction,” whose abiding reality is one of the central recognitions of the American method of government, is miraculously overcome. Obama came to lift us to a higher place, when a better place was all we needed. To feed a hungry man who comes to your door does not require a redesign of your kitchen. The president’s high-minded misreading of the Republicans will stand as one of the most consequential delusions of our time. And it was entirely of a piece with one of the central teachings of Obama’s campaign, which is that people can be brought into politics by endorsing their alienation from politics—and that the answer to alienation is transformation, so that they can go directly from pre-political to post-political. This disarmed them against many disgusting Beltway developments to come, and prepared them only for disappointment. It is irresponsible to weaken people’s patience with imperfection. The Republicans, needless to say, do not regard themselves as too good for politics; and they are right. YET IT MAY BE that the only thing worse than the anti-political going into politics is the anti-political not going into politics. 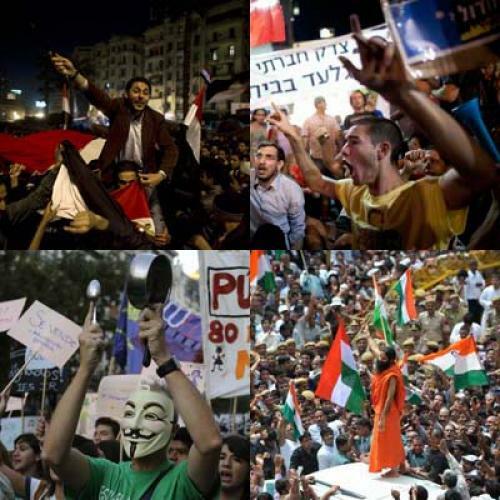 In India, in Israel, and most alarmingly in Egypt, revolts of various noble kinds have been animated by a belief in the righteousness of the non-political. In India, a Gandhian character in white cotton named Anna Hazare, an anti-corruption activist from Maharashtra, was arrested in New Delhi before he could begin a hunger strike in a park. His arrest created a national furor, he was released, he staged his protest. “This is a moral moment,” an exhilarated activist from Hyderabad told The New York Times. “There is a lot of anger in the country, not only to end corruption but to end politics as it is conducted today.” In Israel, “the miracle of the summer of 2011,” as one of its organizers called it, was an extraordinary series of demonstrations around the country, culminating in one of the largest rallies in the country’s history, against the impossible cost of living and the outrageous levels of income inequality in Netanyahu’s Israel. Tent encampments were set up to dramatize the magnitude of the social injustices. At a vast rally in Tel Aviv, a commentator in Haaretz claimed that he had witnessed “the birth of Israeli civil society.” The protests certainly proved, as an Israeli friend of mine remarked, that there is no basis for Reaganism in Israeli society. And in Egypt, well, there was the great revolution of Tahrir Square, where civil society overthrew a dictator. All of these were just causes. They all looked for their integrity to the fact that they originated outside the political system. BUT WHAT NOW? About India I do not know enough to say, though it strikes me that the country could use less Gandhi and more Nehru. In Israel, the protests are winding down because summer is over and everybody must return to work and school: civil society is logistically demanding. People are awaiting the reports of a couple of commissions. Otherwise, as the Talmudic adage has it, olam keminhago noheg, the world is acting according to its custom: Netanyahu, whose sickening mixture of personal expediency and historical rigidity is gravely injuring his country at home and abroad (and all the start-ups in the world will not undo the damage), still faces no serious political challenge. As for Egypt: a few months ago I found myself in conversation with an Egyptian. “Mubarak’s biggest mistake,” he said, “was to shut down the Internet.” I asked him to explain. “Simple,” he replied. “Everybody left their apartments.” Now they are back in their apartments. The most striking fact about the Facebook heroes of Cairo is that they did not proceed to the formation of political parties. “We are going to win because we don’t understand politics,” Wael Ghonim declared in a TED Talk in March. “We’re going to win because we don’t play their dirty games. We’re going to win because we don’t have an agenda.” It makes you want to weep. The Muslim Brotherhood understands politics, and plays their dirty games, and has an agenda. Ghonim later announced on Twitter that he is forming “a technology focused NGO to help fight poverty & foster education in #Egypt.” Cool. But NGOs do not participate in politics. They are designed to circumvent it or to supplement it. I DO NOT UNDERSTAND this confidence that history will be changed by popular epiphanies, or by the virtual epiphanies known as networks. Moral moments come and go. The tents go up, the tents come down. The square fills, the square empties. The only way to perpetuate the accomplishments of the square is to leave the square for politics. The romance of civil society may have gone too far. Anyway, the abdication of politics plays into the hands of forces that already have no use for it. As Evgeny Morozov has written, “You can’t simply join a revolution any time you want, contribute a comma to a random revolutionary decree, rephrase the guillotine manual, and then slack off for months. Revolutions prize centralization and require fully committed leaders, strict discipline, [and] absolute dedication.” There is no question but that politics is unlovely, and appeals to the vices as well as the virtues. Yet it is also the only way to put constraints on power, and to wield power reasonably and accountably. It is true that power is the end of innocence, but who wants innocence? We should want goodness, not innocence. (We should want also a proper definition of goodness.) Politics is all that stands between power and cruelty. Leon Wieseltier is the literary editor of The New Republic. This article appeared in the October 6, 2011, issue of the magazine.